Covered in dense lush forests and featuring some spectacular sights, Oregon is a Pacific Northwest paradise. There are so many unique offerings packed into Oregon’s borders that it may be difficult to choose where to go, so I offer up my top five RV parks, grounds and sites for the Beaver State. This little gem of an RV park is located on westernmost incorporated town in the lower 48 states. You’ll have rich amenities and features at Port Orford RV Village, all sites come with full utility hookups, cable TV, Wi-Fi access and a personal patio and picnic table. You’ll get bright and clean laundry facilities, restrooms and showers to rinse the salt spray off of you. Other amenities and features include complimentary coffee every morning, a recreation room, propane refills and even a fish cleaning station for your day’s catch. The Port Orford area is a sleepy village amongst several fun places to see. Your number one destination is Cape Blanco State Park, a coastal park with hiking trails, beaches, horse riding trails, wetlands and the Cape Blanco Lighthouse, built in 1870. Other popular destinations around the area include the Prehistoric Gardens, Rogue River Boat Ride, Paradise Point Beach, the Coast Guard Museum and plenty others. Seven Feathers RV Resort is a quiet RV park located in southern Oregon but very close to the action of Seven Feathers Casino Resort. It’s difficult to imagine that an RVer could ask for more. A valet guides you to your RV site, all sites are equipped with full utility hookups, free cable TV and wireless internet access. There are laundry facilities and family style restrooms and showers. There are so many other facilities it’s hard to know where to start, there’s a fitness center, trails for strolls and cycling, a media center and group use areas just to name a few. You can take the complimentary over to Seven Feathers Casino for your date with Lady Luck. Play table games, catch some live entertainment, eat at a fine restaurant or let all your stress and worries melt away at the spa and sauna. As with most high level casinos there are concierge services, golf courses and even winery tours available. The Salem area has just about something for everyone and Phoenix RV Park is a great place to start your Salem adventure. This park has all the facilities and amenities you could ever ask for. There are pull through and back in sites available with 30/50 amp hookups, water, sewer and you can pay for direct propane hookups as well. Sites come with cable TV, personal patio areas and are patrolled by private security. You can even have someone come out to wash and detail your RV while you’re out exploring Salem. There are several other facilities available at Phoenix including ADA approved restrooms and showers. The Salem area has a lot to offer the RVer. Try the Enchanted Forest Theme Park or the Riverfront Carousel for family fun. Silver Falls State Park provides some outdoor adventure while the many historic bridges or the Evergreen Aviation Museum provide amateur historians plenty to check out. If you left the kids at home try the Spirit Mountain Casino or check one of the Willamette Valley wineries. Mazama Village is about the closest you can get to Crater Lake without doing some primitive camping. While the amenities are not five star, they definitely will do with their proximity to Crater Lake. You will find RV sites with electricity at Mazama with several water connections and dump stations located throughout the park. Mazama provides picnic tables, fire rings, laundry facilities, restrooms and showers and round out their facilities with a camping store, gas station and a restaurant. Mazami Village is just seven miles from the rim of the spectacular Crater Lake in Crater Lake National Forest, one of this writer’s favorite National Parks. 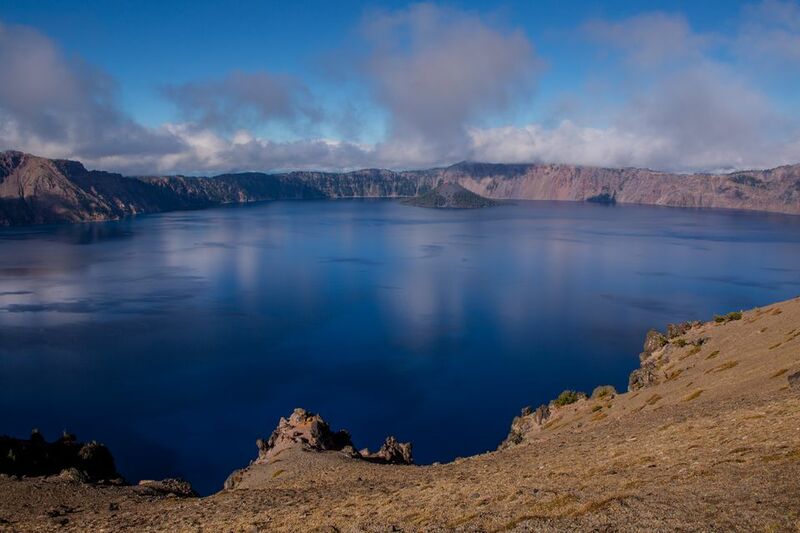 This fifth oldest national park is the site of an ancient volcano whose own destruction leaves us a serene blue lake today. Visitors can hike around the old growth forests or wildflower dotted meadows, take a scenic drive around the rim, participate in ranger-led tours, or just drink in the surroundings, this view never gets old. This highly rated RV park is a great way to experience the lovely northern Oregon Coast. Cannon Beach RV Resort houses over 100 sites complete with full utility hookups as well as complimentary cable TV and wireless internet access right on your level concrete pad. You can expect clean restrooms, showers and laundry facilities as well as an indoor pool and spa, picnic tables, brick fire pits, camp store, group pavilions and more. Staying at Cannon Beach can offer you one of the best views you’ll find anywhere on the Pacific coast. Nearby Ecola State Park is a collection of beaches and trails running from Cannon Beach to Seaside Oregon and its beauty was even recorded by famed American traveler William Clark of Lewis and Clark fame calling it, “The grandest and most pleasing prospects which my eyes ever surveyed.” Cannon Beach is also home to some great dining and unique art galleries you’re like to only find in Oregon. Oregon is a gem in the Northwest, and it’s beautiful scenery and RV parks call out to every RVer.